Electronic fashion by rhyme & reason. 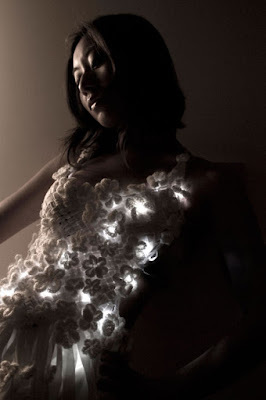 Woven cotton jersey embellished with hand-crocheted flowers and embedded with two dozen bright white LEDs. Interchangeable from battery power to wall power so the dress can become a lamp instead of languishing in your closet after the wedding. NOTCouture, you are a wealth. Hmmm, a bit too 'I got doused in nuclear waste and now I light up' for my liking! But cool none the less. I want to light up the room..but I think that this is a bit much. It'd be so wrong not to have 'you light up my life' played at some point if you wore this..creation!